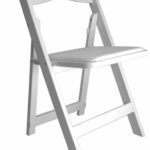 Whether you're planning a wedding, corporate event, graduation party or holiday get-together there's always a need for extra seating. Toomey's carries a wide selection of tables and chairs to help get all your guests seated comfortably. We have several thousand chairs and several hundred tables all ready for pickup or delivery depending on your needs. 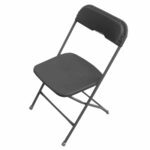 Our most popular chair is our Black and Bronze Samsonite Chair. It has a black plastic seat and back with a painted brown frame. Similar in style but with a different color are our Blue and Bronze and Solid Black styles. 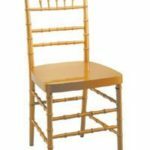 For more formal events we carry White Samsonite, White Wedding, and Gold Chivari Chairs. 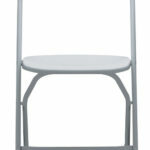 Our Chivari Chairs are best used indoors while the rest of our inventory can be used indoors or out. 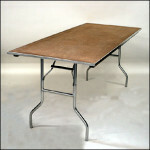 Toomey's also rents tables in a variety of different shapes and sizes. 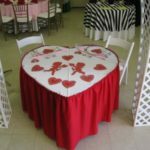 We have rectangular buffet tables, bars, round tables, serpentine and even heart shaped tables for weddings and anniversary parties. 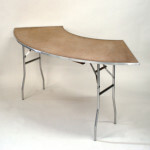 All of our tables are made of wood and have metal folding legs. These tables are far sturdier than the making them great for seating, serving, or display use. 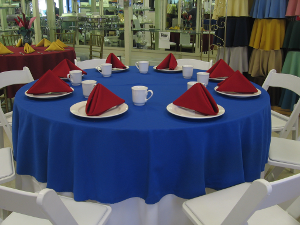 For more information on seating and space requirements please see our Banquet Table page. We'll provide you with all the information you need to begin setting up your seating plans. 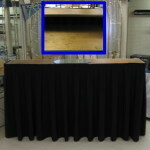 Pricing for this, and other party equipment, can be found in our Party Price List pdf. For most of the year we have equipment on hand but may require time to prepare an order. Toomey's strongly recommends calling in advance to see if equipment is available and to determine whether a reservation is necessary. During the months of May, June, and August we do tend to sell out of equipment and delivery services so we recommend booking early. Delivery and pickup service may be available with advanced notice. Setup and breakdown services are available at an additional cost which can be provided on a per-event quote basis. We recommend placing delivery orders at least a week in advance, last minute or same-day delivery service cannot be guaranteed.